This L-shaped desk brings dynamic form and function to your work space. Perfectly paired with the left/right return, this desk gives you multiple storage and organization capabilities. It features two utility drawers and a locking file drawer for legal or letter size files. 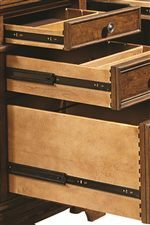 It also includes felt-lined top drawers with adjustable dividers. Enjoy traditional design characteristics such as the bracket feet and oil rubbed bronze hardware, which are also featured on the return portion of this desk. It features one adjustable shelf, a flip-down keyboard tray, and AC outlets at the end of the desk. The Hawthorne L-Shaped Desk with 4 Drawers and AC Outlets by Aspenhome from Bullard Furniture. We proudly serve the Fayetteville, NC area. Product availability may vary. Contact us for the most current availability on this product. I26-307-1 66-Inch Curved Desk for Return with Locking File Drawer and 2 Utility Drawers and 2 Divided Drawers 1 66" 35" 31"
I26-308-1 Left/Right Return with 1 Adjustable Shelf and Outlets 1 52" 19" 31"
The Hawthorne office collection boasts beautiful, traditional design elements and helpful, organizational pieces that come together for the perfect work space. Choose from multiple desk, credenza, and hutch options which are all crafted from cherry veneer and finished in a warm cherry brown. 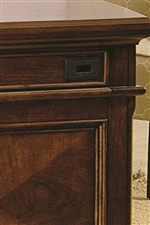 Bracket feet and oil rubbed bronze knobs and bail pulls play into timeless design aesthetics, and the pieces' curved edges give the collection an inviting and romantic appeal. 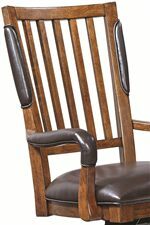 Choose a comfortable office chair, with or without arms, that features a leather padded seat and sides and a five-star base for easy maneuvering. A beautiful bookcase wall displays your favorite books and items, while the lateral filing cabinet is the perfect size for smaller storage. When you're looking to get work done in a classically beautiful work space, think of Hawthorne. 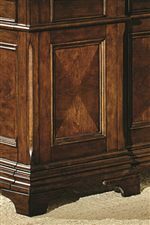 The Hawthorne collection is a great option if you are looking for Traditional furniture in the Fayetteville, NC area.